As a practical matter, moisture accumulates in all transformer designs over the years. While a small portion is found in the oil, some 98 to 99 percent of it becomes diffused in the tons of paper (cellulose) insulation. Without moisture maintenance, every power transformer over 15 to 25 years of age can be expected to be “wet,” that is containing 2.5 to 5 percent of moisture by paper weight, or more. The potential for serious damage to the transformer at these levels of moisture is well known and traditionally the reason for dehydration. 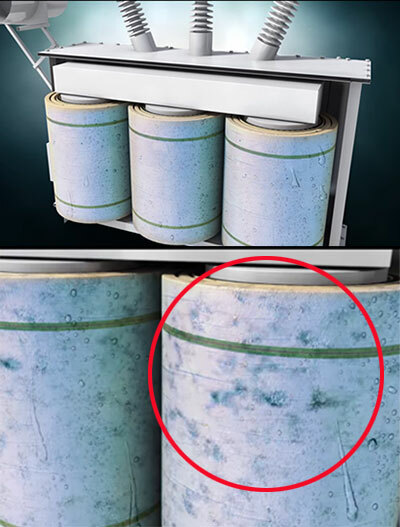 The paper becomes scarred by electrical phenomena that occur in the presence of moisture, such as flashovers between windings, treeing, and creeping discharges. Dramatic temperature changes can bring on the sudden migration of moisture to or from the paper insulation that give rise to the formation of “free water” (or “rain”) slowly draining to the bottom or water vapor rising to the top.